We traveled one-way from Bremerton to Seattle on the 8:00 AM trip. Coming from the Port Orchard foot ferry with a crowd of commuters, the transfer to the connected fast ferry queue should have been easy – but the first issue was that passengers were manually checked in one level upstairs, causing confusion for some and an unnecessary detour for anyone with mobility difficulties. Further, when shown the reservation document on a mobile device, the Kitsap Transit staffer asked instead for a “ticket” that was never emailed. Unlike the rest of the Bremerton ferry terminal, the designated waiting area for 118 passengers is exposed to the weather. Protection from sun, rain, and wind, along with exterior lighting, needs to be installed as soon as possible to ensure not only comfort but also safety on the floating dock. This will become an obvious issue in the dark winter months ahead. But on Monday the sun was shining and a light breeze didn’t bother the waiting crowd. The Rich Passage I showed up in time to discharge a load of commuters from Seattle, and crew displayed practiced efficiency in managing the lines and gangway. On board the seating is similar to a widebody airliner – rows of grouped seats with armrests packed tighly together. If you’re confident you won’t need to move about, head for an interior seat so you don’t need to get up and down to let people out during the trip. There are several tables at the rear for groups or people who want to get in some work during the commute. Compared to a Washington State car ferry, riders will delight at the speed with which the boat leaves Sinclair Inlet and transits Rich Passage. This is by design, as at top speed the catamaran vessel utilizes a hydrofoil to lift almost entirely out the water and minimize wake. Once through, however, the boat slows down to a relatively lukewarm cruising speed to conserve fuel to the rest of the way to Seattle. Approaching Seattle, the advertised 28 minute trip turned into 40 minutes as we waited for a King County water taxi to depart and open up a docking space. John Clauson, Kitsap Transit Executive Director and Port Orchard City Councilmember, said there are no plans to expand the water taxi facilities as part of the Colman Dock rehabilitation. 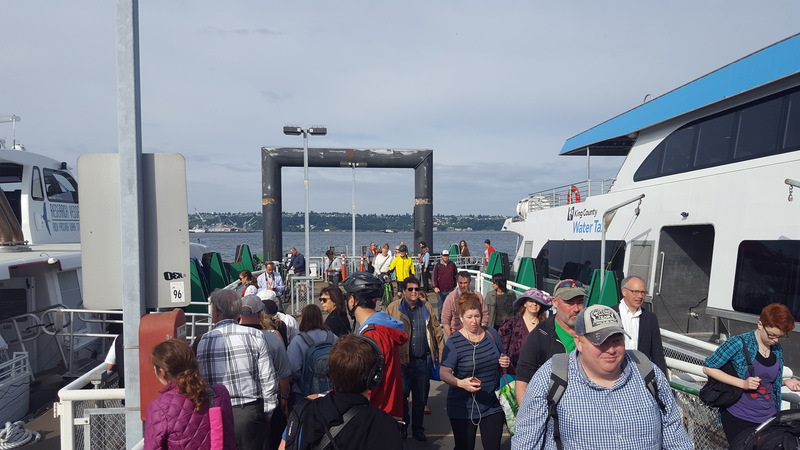 He said the problem will be exacerbated in a few years when five passenger-only ferries (the existing West Seattle, Vashon Island, and Bremerton routes plus the future Kingston and Southworth routes) are jockeying for position as commuters try to get to work at the same time. In the absence of a commitment to fund a dock expansion, King County and Kitsap Transit must work to better coordinate schedules and streamline the board/alight process to reduce conflicts. Overall the new service seems to work well, and with a few adjustments for passenger efficiency and convenience it’ll be ready for expanded operations in the months and years ahead. 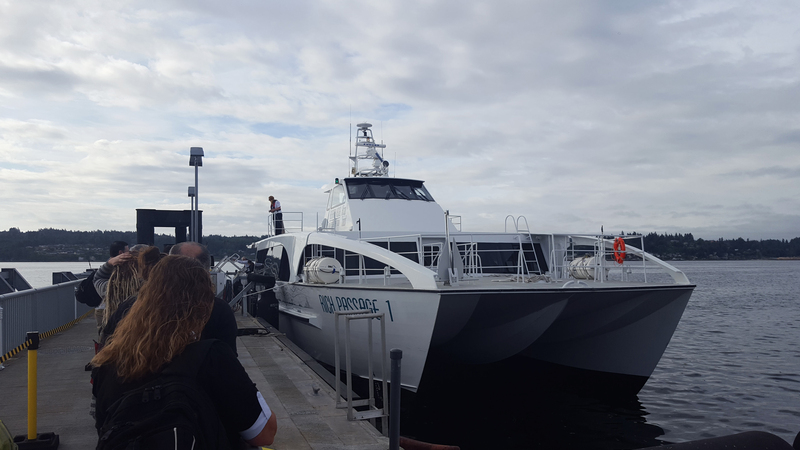 If the early results are successful, Kitsap Transit will complete its current negotiations with All American Marine of Bellingham, WA for at least two additional boats of the same class. 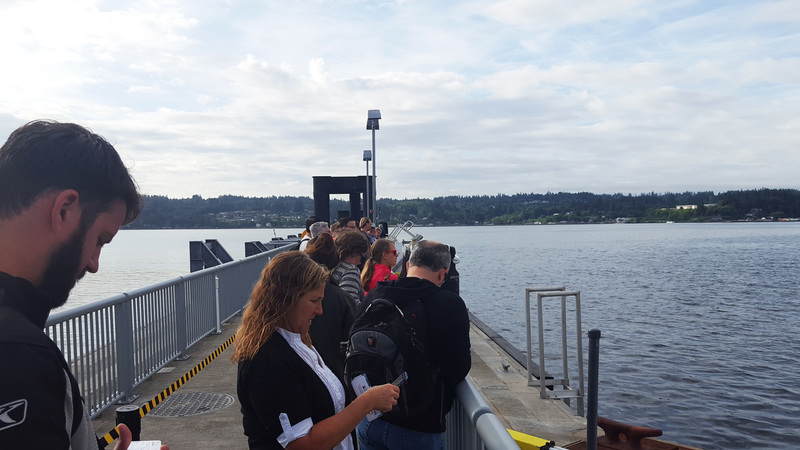 Service may also be beefed up on express buses serving the Bremerton terminal, which some ferry passengers took advantage of. Kitsap Transit’s other looming challenges are providing more robust bus service countywide and the complete lack of transit service on Sundays. For complete information on schedules, fares, and service policies, visit Kitsap Transit’s fast ferry service page. For more information on future planning, visit Kitsap Transit’s ferry plan website. This entry was posted in Ferries, Transportation and tagged Bremerton, catamaran, details, dock, experience, fast ferry, ferry, history, hydrofoil, information, Kitsap Transit, launch, passenger only, Puget Sound, Rich Passage, schedule, Seattle, Sinclair Inlet, tickets, water. Bookmark the permalink.